The Bill Pettit Memorial Award was set up a few years ago by NatSCA to support projects including the conservation, access, and use of natural science collections. One of the recent projects we have been able to help with was the curation of some amazing specimens from the voyage of the Discovery. Hear more about the project from Tammy below. In early 2013 we set about organising the task to begin with the curation of the largest, most recent and least organised of the three collections – that of the ECOMAR collection. The start of the ECOMAR project coincided with commissioning of the new UK Royal Research Ship James Cook officially named by the Princess Royal on 6 February 2007. The first ECOMAR cruise departed from Southampton on 13 July 2007. The ECOMAR project was designed to investigate the Charlie Gibbs Fracture Zone area which lies approximately mid-way between Iceland and the Azores. Four super stations were defined (two north of the Charlie Gibbs Fracture Zone and two to the south), all had the same bottom depth (2500m) and were revisited during voyages by the R.R.S. James Cook and the R.R.S. Discovery during the years 2007–2010 to replicate sampling, time-series investigations and flux studies. The Discovery Collections have no full-time curatorial post and we rely on the goodwill and interest of students and other volunteers (including scientific visitors and work experience volunteers) to help with cataloguing, labelling, respiriting, and general curatorial jobs. The samples, though incredibly valuable should be considered at risk. I look after the collections in as much that I manage the visitors to the collections, host students, and manage public enquiries, visits and displays of the specimens. I am also a taxonomist employed to conduct research, describing new species and studying the ecology of the deep-sea benthic fauna. I was employed for four years to work on the ECOMAR program to describe the ecology of the scavenging fauna of the area. I therefore had a particular interest in the curation of this collection. We employed Amanda Serpell-Stevens, to work on this project, but we had funds for only 8 weeks of her time. Thus the project was reduced from cataloguing the three large collections to just one. When Amanda’s contract ended there was still much reshelving and reordering of the material to be carried out which was carried out on an ad hoc basis by myself, a retired member of staff, Mike Thurston, and Amanda who returned on a voluntary basis to continue work on the project. 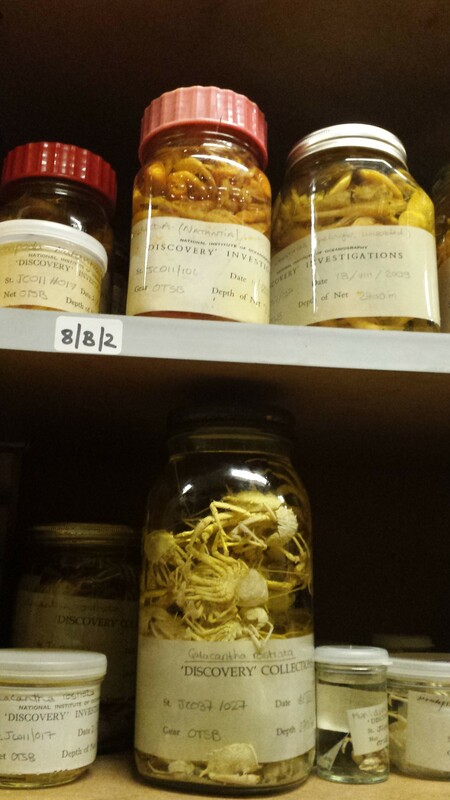 The project began by working shelf by shelf to curate and to catalogue (in paper record) what was held including location and size of each jar, and to change containers for those specimens that were in plastic containers or inappropriate sized jars. 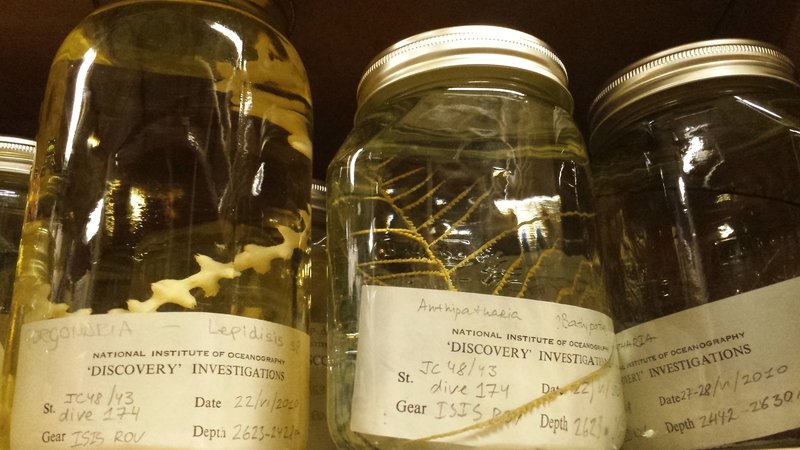 The preservative was also replaced in most of the jars and a new label produced for each specimen, as many were poorly labelled. This curation and cataloguing process took the majority of the 8 weeks, with just enough time remaining to enter the data into Excel. With the availability of a digital catalogue the task of reorganising the lots into taxonomic order was greatly eased. This meant adjustment of shelf heights to incorporate the various sizes of tubs and jars (some of the lots are 20 litre tubs full of holothurian specimens of a single species), and removing all the specimens in turn, which were then replaced first by taxonomic order then by station order using Excel to sort the data. The spreadsheet was updated with the new locations of the specimens as we progressed. The final part of the process involved cross referencing the specimens with the newly published papers and updating the names where they had changed (on both the specimen labels and in the spreadsheet). There were numerous new species described during the ECOMAR project, which meant further problems in allocating the correct new name to specimens in the collections variously named as e.g. Peniagone sp. nov ‘pink’. While holotypes have been registered in the NHM, London, the rest of the material needs updating to current knowledge, a process which is often neglected, despite it being referenced in the many new publications resulting from the project. It is very satisfying to have the ECOMAR collection properly curated and to know that I can locate any specimen needed easily. In total we curated, relabelled and catalogued a total of 1300 lots comprised of 1148 smaller jars, 88 tubs (between 5 and 20 litres) and 64 loan specimens. We plan to publish a detailed analysis of this work for the NatSCA journal, including a list of available species, and will make the catalogue available online when time and funding allow. In the meantime interested parties can contact Tammy Horton (tammy.horton@noc.ac.uk) for a copy. 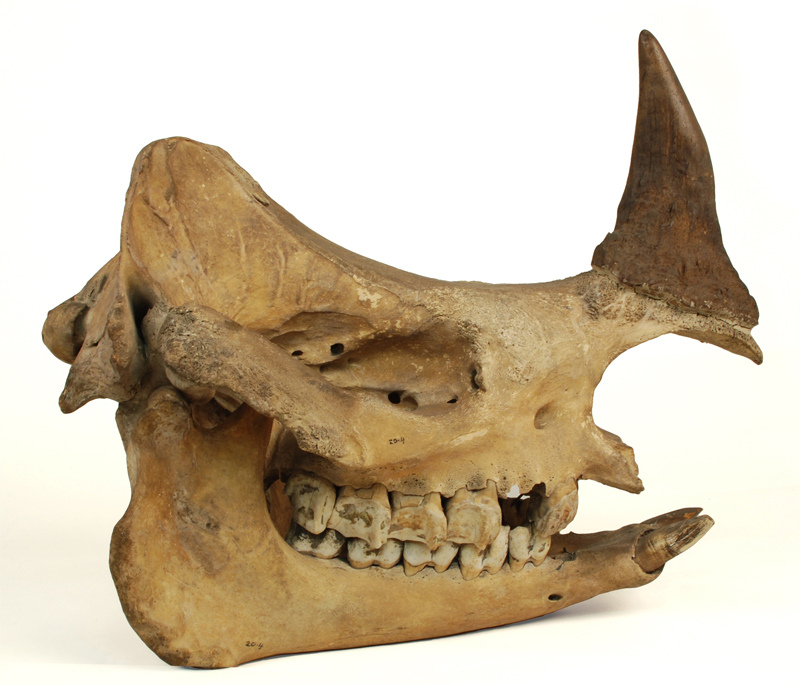 Rhinoceros horn thefts have been a problem for a while, with several UK museums being amongst those targeted by thieves. If you haven’t hidden away your rhino horn yet you should do it now! Despite the rather dire situation, it is heartening that in several cases the people responsible for thefts have later been arrested and convicted. It is also interesting to note that rhino horn is being intercepted and seized at airports and in Police raids. Of course, a seized horn isn’t easy to return to its owner unless it has a unique identification – after all, rhino horns can look rather similar to each other. This is especially problematic when the material is seized in the destination country rather than the country from which it was taken. To tackle this problem, the Wildlife DNA Forensics – Diagnostics & Molecular Biology Section of Science and Advice for Scottish Agriculture (SASA) have just started on a project to establish a DNA database for rhino horn in museums and zoos in Europe. This service is currently being offered for free to museums in the UK. The database will provide a mechanism for the identification of stolen rhino horn, which will make return of specimens possible and (perhaps more importantly) make it far easier to demonstrate whether seized material has been stolen as well as illegally traded/imported/exported. This would mean longer prison sentences for guilty parties – which may be a better deterrent than the paltry sentences sometimes handed out – and it would also help identify the chain of supply for rhino horn, which could play an important role in restricting the trade. The database could also potentially contribute to other research on rhinos – perhaps about their past genetic diversity, which may contribute to a better understanding of their conservation requirements in the future. In light of the obvious security concerns associated with rhino horn, NatSCA have been in touch with the representative for SASA who is heading up the project, Dr Lucy Webster. “We realise the sensitivity of the information you are providing. The information you submit with your samples will be held securely and transcribed into electronic format as part of the database. The database will be hosted on a government secure network, with access restricted to those directly involved in this project. Some concerns have been raised regarding the security of this information in relation to Freedom of Information (FOI) requests. We have consulted with Scottish Government FOI unit and while we are obliged to consider all requests, the sensitive nature of the information means that we have good grounds for withholding detailed information (e.g. addresses of submitters). It’s worth keeping in mind that the project does not ask for the specific storage location of any rhino material and there are no visits to museum sites by external parties involved in the data collection – the specimens are sampled by staff at the museum using the guidance provided below. Obviously there are still considerations about getting involved in the project, since sampling involves drilling a 5mm hole in specimens (alas the surface sampling technique using a rubber that we saw at this year’s conference only provides enough data for species level analysis, not individual identification), but that has to be balanced against the potential benefits offered by the database. Whether you send in your samples is a decision for you and your organisation, but if you would like more information you can contact a NatSCA committee member or get in touch with Lucy.